Autoreactive B cells may become activated in a T-independent manner via synergistic engagement of the BCR and TLRs. Using the VH3H9 Ig H chain transgene to track anti-chromatin B cells, we demonstrate that VH3H9/Vλ1 anti-chromatin B cells proliferate in response to stimulatory oligodeoxynucleotides containing CpG motifs, suggesting that these autoreactive B cells are responsive to TLR9 signaling. Strikingly, some VH3H9 B cells, but not the well-characterized VH3H9/Vλ1 B cells, proliferate spontaneously in culture medium. This proliferation is blocked by inhibitory CpG oligodeoxynucleotides, implicating the TLR9 (or possibly TLR7) pathway. Most hybridomas generated from the proliferating cells are polyreactive, and one exhibits binding to nuclear Ags but not to the other Ags tested. Thus, B cells carrying autoreactive and/or polyreactive specificities may be susceptible to T cell-independent activation via dual engagement of the BCR and TLRs. Although some autoreactive B cells are eliminated from the repertoire via deletion or receptor editing, others are present in the periphery (1). The significance of these cells rests with their potential to be activated to produce autoantibodies and/or to function as APCs (2). Previous studies using the VH3H9 Tg model have shown that the provision of cognate T cell help is sufficient to drive peripheral anti-chromatin B cells to differentiate into Ab-secreting cells (ASCs)3 (3). Importantly, this activation requires a breach in T cell tolerance (4). B cells can also be activated via T-independent means, such as by oligodeoxynucleotides (ODNs) containing CpG motifs. Infectious agents may introduce T-independent mitogens that can activate autoreactive B cells; indeed, a relationship between infection and the production of autoantibodies has been suggested (5, 6, 7, 8, 9, 10, 11). Moreover, CpG responses in lupus-prone mice are abnormal and CpG injection exacerbates their renal disease (12, 13, 14, 15). B cells express a number of TLR molecules that are mitogenic when triggered (16, 17, 18, 19, 20, 21). Recently, a hypothesis centered on TLR ligation has been advanced to explain why the discrete set of autoantibodies characteristic of systemic lupus erythematosus are elicited (22). Such a model comes from studies using rheumatoid factor (RF) autoreactive B cells (23). RF B cells were shown to proliferate in vitro in response to immune complexes present in “spent” tissue culture medium that contain the RF Ag complexed with mammalian chromatin. This proliferation is largely dependent upon TLR signaling (22, 24, 25). Binding of the BCR to nuclear Ags with CpG motifs and subsequent internalization may focus the Ag to the internal cellular compartments containing TLR9 (26) as well as provide a second stimulatory signal to enhance activation (16, 22). Although the frequency of stimulatory TLR9 motifs is reduced in mammalian DNA compared with bacterial DNA, these motifs may be enriched in DNA released from apoptotic cells (25, 27). Nuclear Ags are packaged and displayed in discrete blebs on apoptotic cells, and anti-dsDNA Abs can bind to these regions (28, 29). The importance of TLR9 in autoantibody production in vivo came with the demonstration that autoimmune-prone mice lacking TLR9 have reduced anti-dsDNA and anti-chromatin serum Abs (30). Furthermore, mice deficient in the TLR adaptor protein MyD88 have reduced titers of all the major lupus-associated autoantibodies (31). Another report, however, challenges the role of TLR9 signaling, suggesting it has a protective role in murine lupus (32). Anti-chromatin B cells may be activated in a similar fashion to RF B cells upon encounter with a chromatin Ag that sequentially signals through the BCR and TLRs (25). Indeed, experiments using the VH3H9 Ig H chain transgene demonstrated spontaneous proliferation of VH3H9 B cells when cultured with medium alone (25). This proliferation was apparently a result of TLR9 binding to endogenous ligands extruded into tissue culture fluids, as inhibitors of the TLR9-signaling pathway blocked proliferation (25). As VH3H9 Tg mice contain autoreactive as well as nonautoreactive B cells (33, 34), the specificity of the B cells proliferating in medium alone could not be identified. In this study, we identify the specificity and Ig L chain usage of spontaneously proliferating B cells from the VH3H9 model. B cells that have been chronically exposed to Ag, such as autoreactive anti-chromatin B cells, have been shown to have altered responses to TLR mitogens compared with Ag-inexperienced or ignorant B cells (35, 36). For example, when splenocytes from VH3H9 mice are cultured with LPS, the VH3H9/Vλ1 anti-chromatin B cells are hypoproliferative (37). To test whether the VH3H9/Vλ1 anti-chromatin B cells are uniformly resistant to stimulation through TLRs, we evaluated their responsiveness to exogenous TLR9 ligation using synthetic ODNs. In addition, we tested the reactivity of the VH3H9/Vλ1 anti-chromatin B cells to endogenous TLR9 ligands originating from tissue culture conditions. VH3H9 transgene (Tg) mice (33), Sd-TgVH3H9 mice (38), and Igκ-deficient (Igκ−/−) mice (39) have been described previously. Mice bearing either version of the Tg were mated with Igκ−/− mice to generate VH3H9 Tg Igκ−/− or Sd-Tg VH3H9 Igκ−/− mice (40). Presence of the VH3H9 Tg was determined by PCR amplification of tail DNA as described (33) and deficiency in the κ locus was determined by flow cytometry on PBLs as described (3). In all cases, age-matched Tg− littermates or BALB/c mice purchased from Harlan Sprague Dawley were used as controls. All mice were maintained under specific pathogen-free conditions at the Wistar Institute using an Institutional Animal Care and Use Committee-approved protocol. Single-cell suspensions from spleens were filtered through a 70-μm strainer (Fisher Scientific). Erythrocytes were removed using RBC lysing buffer (Sigma-Aldrich), and total live cell numbers were determined by trypan blue exclusion. Standard protocols (41) were used for preparation and staining of 0.5–2 × 106 cells. For flow analysis on FACScan or FACSCalibur flow cytometers (BD Biosciences), anti-CD22-FITC (Cy34.1), anti-Igλ1-biotin (R11-153), and anti-CD45R/B220-PE (RA3-6B2) (BD Pharmingen) were used. Biotinylated Igλ1 was revealed with streptavidin (SA)-PerCP, -PerCP-Cy5.5, or -PE-Cy7 (BD Pharmingen). All flow cytometry data were analyzed using CellQuest (BD Pharmingen) or FlowJo (Tree Star). In some cases, cells were resuspended in 1 nM TOPRO-3 iodide (Molecular Probes) before analysis to assist in dead cell exclusion. To determine cell numbers, the percentage of B220+ or B220+Igλ1+ cells (of total live cells) was multiplied by the total live cell count determined by trypan blue exclusion. For some experiments, splenocytes were stained with anti-CD45R/B220-allophycocyanin (RA3-6B2), anti-CD23-PE (B3B4), and/or anti-CD21/CD35-FITC (7G6) (BD Pharmingen) and positively sorted on B220+, CD23+, and/or CD21+ live lymphocytes using a Cytomation MoFlo. The following inhibitory (2088: 5′-TCC TGG CGG GGA AGT-3′) (42), stimulatory (3MD: 5′-TCC ATG ACG TTC CTG ATG CT-3′ (16) or 1826: 5′-TCC ATG ACG TTC CTG ACT TT-3′) (25) or nonstimulatory (2310: 5′-TCC TGC AGG TTA AGT-3′) (42) CpG-containing ODNs were synthesized on a phosphorothioate backbone according to published sequences (Oligos Etc. or Coley Pharmaceuticals). Cells were labeled with CFSE (Molecular Probes) as described (43). Labeled cells were cultured (2 × 106 cells/ml) under the following conditions: medium alone (RPMI 1640/10% FCS/5 × 10−5 M 2-ME), stimulatory CpG ODN (2 μg/ml 3MD ODN or 1826 ODN), nonstimulatory CpG ODN (2 μg/ml 2310 ODN), inhibitory CpG ODN (2 μg/ml 2088 ODN), LPS (Escherichia coli v5 (rough strain Rc mutant)) (Sigma-Aldrich), purified anti-CD40 (3/23) (BD Pharmingen) or anti-IL-4 (11B11) (34). After 3 days, cells were harvested, live cell counts were determined, and proliferation was assessed by flow cytometry. For additional experiments, supernatants stimulated with or without stimulatory CpG ODN were harvested from cultures containing VH3H9 cells after 3 days and combined with CFSE-labeled Tg− cells for an additional 3 days. For all experiments, cell recoveries were determined by dividing the number of cells recovered on day 3 by the number of cells initially placed in culture for each condition. Unlabeled cells from Tg− BALB/c or VH3H9 Tg Igκ−/− spleens were cultured with stimulatory or nonstimulatory ODN as described above for 7 days. Supernatants were collected on day 7 and tested by an ELISA to detect Ig production. Before incubation with supernatant, ELISA plates (ThermoLabSystems) were coated with 2 μg/ml unlabeled anti-IgMa (clone DS-1; BD Pharmingen). Ab binding was detected using biotinylated anti-Igλ1 (BD Pharmingen; 2 μg/ml) followed by SA-alkaline phosphatase (AP) (Southern Biotechnology Associates). To obtain normalized ELISA values based on input Igλ1 B cell numbers, ELISA OD values were divided by the absolute number of Igλ1 B cells plated on day 0. This number was determined by multiplying the number of cells plated on day 0 by the frequency of CD22+Igλ1+ B cells, as determined by flow cytometry. Spleen cells were cultured with medium alone, stimulatory ODN, or nonstimulatory ODN as described above for 4 days. On days 0 (preculture) and 4, cells were harvested and tested for Ab production on a per cell basis using the ELISPOT assay as described (44). Plates (96-well Multiscreen-HA filter plates (Millipore)) were coated with 2.0 μg/ml unlabeled-anti-IgMa (BD Pharmingen), detected with biotin-conjugated anti-Igλ1 (BD Pharmingen) followed by SA-AP (Southern Biotechnology Associates), and developed as described previously (44). Plates were read on an ImmunoSpot reader (Cellular Technology). The images were acquired and analyzed with Image Acquisition 4.4 and ImmunoSpot 3 software, respectively (Cellular Technology). 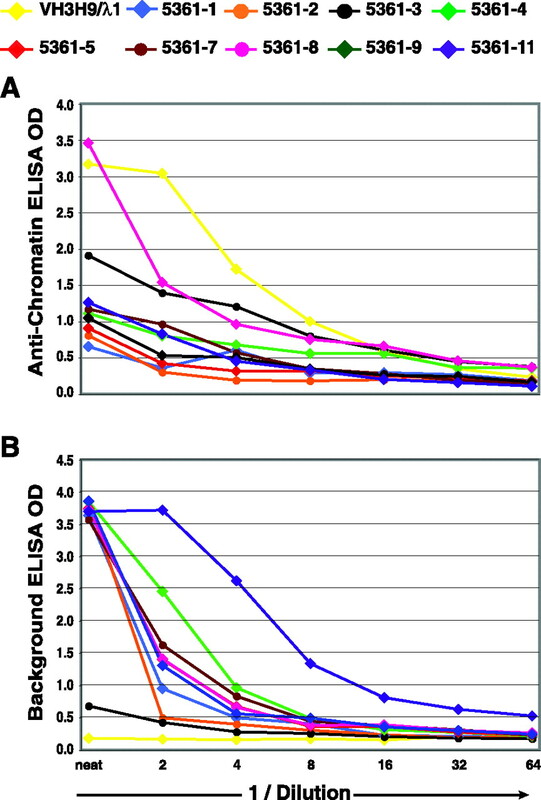 ELISPOT ASC values were normalized in the same manner as the ELISAs. The ImmunoSpot 3 software was used to determine mean spot size (limited to spots 0.0146–0.1525 mm2 in size). Spleen cells from a VH3H9 Tg mouse were CFSE labeled as described (43) and cultured in medium alone. On day 3, B cells that had undergone proliferation (CFSElow) were isolated by cell sorting and fused with Sp2/0 cells as described (34). Supernatants from cell cultures were tested for H or L chain usage by ELISA. For H chain isotype determination, plates were coated with anti-total Ig (human absorbed; Southern Biotechnology Associates) and detected with either anti-IgG-AP or anti-IgM-AP (human absorbed; Southern Biotechnology Associates). For L chain usage, plates were coated with either anti-Igκ or anti-Igλ (Southern Biotechnology Associates) and detected with anti-total Ig-AP (human absorbed; Southern Biotechnology Associates). Plates were developed as described previously (40). Hybridoma supernatants were analyzed by ELISA for total IgM concentration (as described above) and then normalized by dilution in medium such that each supernatant contained 0.13 μg/ml Ig. ELISA plates (ThermoLabSystems) were coated with 2 μg/ml chromatin overnight at 4°C. The remaining steps were conducted at room temperature. All washes were conducted at least eight times in 1× PBS/0.05% Tween 20. Following the coating step, plates were washed, blocked with 1% BSA/PBS/azide for at least 1 h, and washed again. Supernatants were first tested at neat dilution and then at serial dilutions of 1/2 and incubated for a minimum of 1 h. Plates were washed and incubated with developing Ab (anti-IgM-AP), for at least 1 h. Finally, plates were washed and developed with ImmunoPure PNPP (Pierce) as the substrate. Absorbances were read at dual wavelength, 405 nm/650 nm, using a microplate reader. To determine background staining levels, the assay was conducted as described but without initially coating the ELISA plates with chromatin. Immulon II plates (Thermo Electron) were coated with 100 μl of 20 μg/ml CL (Avanti Polar Lipids) in 100% EtOH overnight at 4°C, and then blocked with PBTN (PBS plus 1% BSA plus 0.05% Tween 20 plus 0.02% NaN3) for 30 min at room temperature. Plates were then washed six times with PT (PBS plus 0.05% Tween 20). 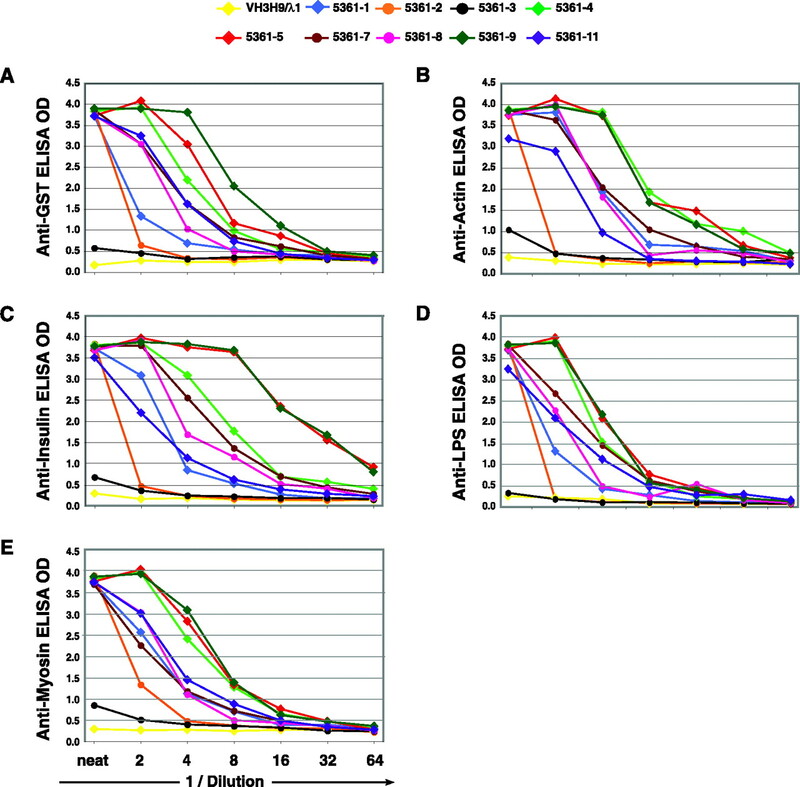 Hybridoma supernatants were normalized such that each supernatant contained 0.13 μg/ml Ig. A total of 100 μl of supernatant (titrated 1:2, in duplicates starting with neat supernatant) was added per well and incubated for 2 h. The FB1 Ab (45), treated similarly to the hybridoma supernatants, was used as a positive control. Plates were then washed six times with PT and then 100 μl of goat-anti-mouse IgM conjugated with AP was added per well and incubated for 1.5 h. Next, plates were washed twice with PT and then twice with AP buffer (10 mM diethanolamine plus 0.5 mM MgCl2). A total of 150 μl of substrate stock (1 mg/ml PNPP in AP buffer) was added per well, and after 1 h of developing, plates were read at 405 nm. Jurkat T cells were induced into apoptosis as described previously (46). Cells were harvested and resuspended in 1 ml of 1× H3 (Cellgro HBSS with 8.5 mM NaHCO3, 3 mM NaN3, and 3 mM CaCl2), then spun down and resuspended in H3 plus 6% paraformaldehyde and incubated for 15 min on ice. Cells were washed (H3 plus 3% FBS) and then resuspended with undiluted hybridoma supernatants, incubated for 30 min on ice, and washed with H3 plus 3% FBS. Dye mixture (Sytox orange, Alexa Fluor 647-conjugated goat anti-mouse IgM, and Alexa Fluor 488-conjugated annexin V) (Molecular Probes) was added for 20 min on ice. Cells were washed, prepared in mounting medium (1:1 glycerol, H3), and viewed on a confocal microscope (Leica, TCS SL). Supernatants were normalized by dilution in medium so that all supernatants contained the same amount of Ig (0.13 μg/ml). Supernatants were then used neat or serially diluted 1/2 before plating. ELISA plates were coated overnight with one of the following reagents: LPS (10 μg/ml final concentration; Sigma-Aldrich), insulin (5 μg/ml final concentration; Sigma-Aldrich), GST (2 μg/ml final concentration, provided by A. Caton, The Wistar Institute), actin (2 μg/ml final concentration; Sigma-Aldrich), or myosin (2 μg/ml final concentration; Sigma-Aldrich). Supernatant binding was detected using anti-IgM-AP (human absorbed; Southern Biotechnology Associates) and plates were developed as described previously (40). Genomic DNA was purified from hybridoma cell pellets using a DNeasy kit (Qiagen). VH3H9 usage was assayed by PCR, as described previously (33). For L chain sequencing, PCR amplifications were conducted on 100 ng of genomic DNA in a total volume of 20 μl using Vs plus Jκ2, Vs plus Jκ5 and L5 plus Jκ2 primer combinations, as described previously (47). PCR amplicons were band purified (QIAquick gel extraction kit; Qiagen) and TA cloned into the pCR2.1 vector (TA cloning kit; Invitrogen Life Technologies). Cloned inserts were sequenced from both directions using M13for and M13rev primers. DNA sequencing was performed using an ABI 3100 capillary sequencer at the University of Pennsylvania DNA Sequencing Core Facility (〈www.med.upenn.edu/genetics/core-facs/dna-seq/〉). Vκ sequences were analyzed with IgBLAST (〈www.ncbi.nlm.nih.gov/igblast/〉). ANA assays were performed using neat supernatants from hybridoma cultures as described (48). Briefly, ANA slides with fixed, permeabilized HEp-2 cells (Antibodies Incorporated) were incubated with neat hybridoma supernatants and binding was detected using anti-IgM-FITC plus anti-IgG-FITC Abs (Southern Biotechnology Associates). Statistical significance was determined using the two-tailed, unpaired Student t test in the Microsoft Excel software. The VH3H9 Ig H chain Tg, both as the original Tg (33) and as a site-directed VH3H9 Tg (Sd-Tg VH3H9) (38), has been used to study lupus-associated B cells. The VH3H9 H chain can pair with a variety of endogenous L chains to form a B cell repertoire that includes both autoreactive and nonautoreactive B cells (49). As Igλ1, paired with the VH3H9 H chain, forms an anti-chromatin Ab (49), anti-Igλ1 Abs can be used to identify the anti-chromatin B cells in VH3H9 mice. VH3H9/λ1 B cells express higher levels of Igλ1 in Sd-Tg VH3H9 than in VH3H9 Tg mice, although both remain lower than that observed in nontransgenic mice (see Fig. 1⇓B and Ref. 50); the higher level on B cells from Sd-Tg mice could be due to coexpression of both IgM and IgD (rather than IgM-only on the original VH3H9 Tg mice), or to a higher rate of H chain editing in Sd-Tg VH3H9 mice (38, 50). Proliferation of B cells to exogenous and endogenous TLR9 ligands. 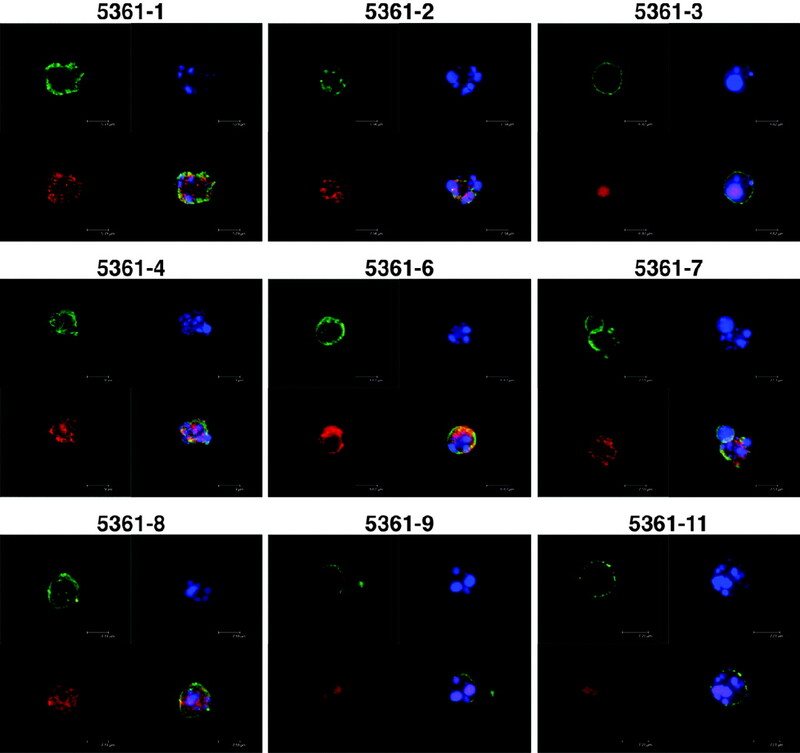 Splenocytes from Tg−, VH3H9 Tg, or Sd-Tg VH3H9 mice (A and B) or Tg− Igκ−/−, VH3H9 Tg Igκ−/−, or Sd-Tg VH3H9 Igκ−/− (C) were CFSE labeled and cultured in stimulatory CpG ODN (3MD), medium alone, or inhibitory CpG ODN (2088) for 3 days. Shown are representative dot plots, gated on live cells using forward/side scatter. A and B, Sample sizes: Stimulatory CpG ODN: Tg−, n = 13; VH3H9 Tg, n = 11; Sd-Tg VH3H9, n = 3; medium alone: Tg−, n = 12; VH3H9 Tg, n = 11; Sd-Tg VH3H9, n = 3; inhibitory CpG ODN: Tg−, n = 11; VH3H9 Tg, n = 10; Sd-Tg VH3H9, n = 3; (C) n = 3 for Tg−κ−/−, VH3H9 κ−/− or Sd-TgVH3H9 κ−/− mice under all conditions. D, Positively sorted (B220+CD23+CD21int, high VH3H9 Tg B cells (98.78% pure) or unpurified VH3H9 Tg spleen cells were CFSE labeled and cultured in medium alone for 3 days. Shown are representative dot plots, gated on live cells using forward/side scatter, n = 5. E, Splenocytes from VH3H9 Tg mice were sorted into B220+CD23+CD21low (97.27% pure) and B220+CD21+CD23low (99.87% pure) populations, and then CFSE labeled and cultured in stimulatory CpG ODN (3MD) for 3 days. Shown is a representative histogram, gated on live cells using forward/side scatter. FO, Follicular VH3H9 Tg B cells; MZ, marginal zone VH3H9 Tg B cells, n = 6, (Tg−, n = 1, data not shown). F, VH3H9 Tg splenocytes were placed in culture for 3 days with stimulatory CpG ODN (3MD) or medium alone. At day 3, the spent VH3H9 supernatants were collected and added to CFSE-labeled Tg− splenocytes. Shown is a representative histogram, gated on live and B220+ cells, (gray line = VH3H9 Tg CpG ODN (3MD) supernatant, black line = VH3H9 Tg supernatant alone, dotted gray line = Tg− cells alone, n = 3). To test the proliferation potential of anti-chromatin B cells, splenocytes from VH3H9 Tg and Sd-Tg VH3H9 mice were labeled with CFSE and then cultured for 3 days with stimulatory CpG ODN (3MD ODN or 1826 ODN), medium alone, or inhibitory CpG ODN (2088 ODN). Non-Tg splenocytes were also cultured for comparison. 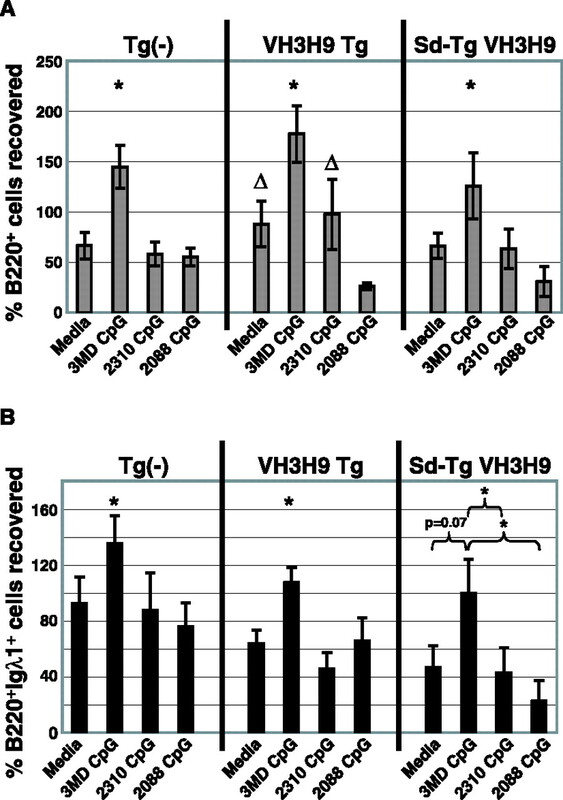 When cultured with stimulatory CpG ODN, the majority of B cells recovered from Tg−, VH3H9 Tg, and Sd-Tg VH3H9 mice had proliferated at least once (95 ± 1%, 87 ± 7%, and 92 ± 2%, respectively, of B220+ cells were CFSElow, Fig. 1⇑A). There was no significant difference in B cell proliferation to stimulatory CpG ODN between the three strains (p > 0.05). Importantly, anti-chromatin VH3H9/λ1 B cells from VH3H9 Tg and Sd-Tg VH3H9 mice were included within the population of proliferating cells (Fig. 1⇑B). When splenocytes were placed into culture with medium alone, most B cells had died or were apoptotic by day 3, based on trypan blue exclusion, forward/side scatter by flow cytometric analysis, and/or cellular incorporation of the dye TO-PRO3 (data not shown). However, a significant percentage of the remaining B220+ cells from the VH3H9 Tg mice (average of 50 ± 8%) and Sd-Tg VH3H9 (average 23 ± 9%) had proliferated in medium alone compared with the Tg− BALB/c mice (7 ± 4%; p = 0.001 for VH3H9 Tg and p = 0.05 for Sd-Tg VH3H9) (Fig. 1⇑A). Viglianti et al. (25), using 3H incorporation, have also reported proliferation of VH3H9 B cells in medium-alone conditions. Furthermore, the proliferation of B cells from VH3H9 Tg or Sd-Tg VH3H9 mice in medium-alone cultures was significantly blocked by the addition of inhibitory CpG ODN (p < 0.05; Fig. 1⇑A), suggesting that the stimulus responsible for inducing proliferation may signal through TLR9 (22, 25, 42). In contrast, the proliferation of Tg− B cells in medium alone conditions was not blocked by inhibitory CpG ODN (p = 0.8; Fig. 1⇑A), indicating that the low level of proliferation in this case is not TLR9 dependent. To investigate the specificity of the inhibitory CpG ODN, splenocytes from Tg− mice were CFSE labeled and then cultured for 3 days with stimulatory CpG ODN (3MD), stimulatory CpG ODN (3MD) plus inhibitory CpG ODN (2088), LPS, LPS plus inhibitory CpG ODN (2088), anti-CD40 plus IL-4, and anti-CD40 plus IL-4 plus inhibitory CpG ODN (2088). The inhibitory CpG ODN (2088) blocked only CpG ODN (3MD) proliferation (data not shown, n = 3). To test whether a soluble factor unique to the VH3H9 Tg supernatants was responsible for VH3H9 B cell proliferation, Tg− spleen cell cultures were combined with supernatants from VH3H9 Tg spleen cell cultures. This did not induce Tg− B cell proliferation (Fig. 1⇑F). To assess the requirement for accessory cells in the proliferation of VH3H9 Tg cultures, the proliferation of purified VH3H9 Tg B cells was compared with their unpurified counterparts after 3 days in culture. As shown in Fig. 1⇑D, both unpurified and purified cells proliferated in medium, indicating that the proliferation appears independent of non-B cells. Notably, VH3H9/λ1 B cells did not proliferate in response to culture fluids (Fig. 1⇑B). This proliferation was confined to Igκ+ cells from the VH3H9 Tg or Sd-Tg VH3H9 mice. This was further confirmed by mating the VH3H9 Tg to Igκ-deficient mice, thus generating VH3H9 Tg Igκ−/− or Sd-Tg VH3H9 Igκ−/− mice. In this case, proliferation in medium-alone cultures was reduced to nontransgenic levels for both VH3H9 Tg Igκ−/− mice (average of 8 ± 2% of remaining B220+ cells were CFSElow), and Sd-Tg VH3H9 Igκ−/− mice (12 ± 5%; p > 0.05 for both strains compared with Tg−Igκ−/− mice; Fig. 1⇑C). The anti-chromatin B cells from VH3H9 Tg Igκ−/− (87 ± 4%) and Sd-Tg VH3H9 Igκ−/− (88 ± 7%) mice did, however, proliferate to exogenous stimulatory CpG ODN, as did the VH3H9/Vλ1 B cells in Igκ-sufficient mice (Fig. 1⇑, B and C). VH3H9 Tg mice have been reported to have an exaggerated marginal zone area compared with Tg− mice and some have suggested that autoreactive cells reside in the marginal zone (50, 51). To determine whether there was a difference in the proliferative capacity to CpG between marginal zone and follicular B cells in VH3H9 Tg mice, splenocytes were sorted into B220+CD21+CD23low and B220+CD23+CD21low populations, CFSE labeled, and cultured for 3 days with stimulatory CpG ODN (3MD) and LPS. We found that marginal zone and follicular B cells from both VH3H9 Tg and Tg− mice proliferated equally well to CpG, whereas marginal zone B cells from both genotypes were hyperproliferative to LPS (Fig. 1⇑E and data not shown) (52). Recovery of total B220+ cells or B220+Igλ1+ cells (from all mouse genotypes) was higher from stimulatory CpG ODN cultures than from cultures with medium alone, inhibitory CpG ODN, or nonstimulatory CpG ODN (2310) (Fig. 2⇓). Consistent with the finding that many cells from VH3H9 mice proliferated in cultures provided with no exogenous stimuli, VH3H9 B cell recovery from medium-alone or nonstimulatory CpG ODN cultures was significantly higher than when cells were cultured in the presence of inhibitory CpG ODN (Fig. 2⇓, p < 0.05). This was not the case for Tg− cultures. B cell recoveries from stimulation cultures. B cell (B220+ (A), or B220+ Igλ1+ (B)) recoveries from B cell proliferation cultures shown in Fig. 1⇑, A and B, were calculated. Also included are cellular recoveries from cultures with nonstimulatory CpG (2310 ODN). 3MD is stimulatory CpG, and 2088, inhibitory CpG. A, B cell recoveries from all strains are significantly higher with stimulatory CpG ODN than with medium alone, nonstimulatory ODN, or inhibitory ODN (∗, p < 0.05). Δ, Recovery from VH3H9 Tg B cells is higher in both medium-alone and 2310 CpG ODN than 2088 CpG ODN (p < 0.05). n listed as in Fig. 1⇑A. For nonstimulatory CpG cultures, Tg−, n = 13; VH3H9 Tg, n = 11; and Sd-Tg VH3H9, n = 3. B, B220+Igλ1+ recoveries from cultures with cells from Tg− BALB/c or VH3H9 Tg mice are higher with stimulatory CpG ODN than with medium alone, nonstimulatory ODN, or inhibitory ODN (∗, p < 0.05). B220+Igλ1+ recoveries from cultures with cells from Sd-Tg VH3H9 mice are higher with stimulatory CpG ODN than with nonstimulatory ODN, or inhibitory ODN (p < 0.05, n = 3). Compared with medium alone cultures, B220+Igλ1+ recoveries from cultures with cells from Sd-Tg VH3H9 mice given stimulatory CpG ODN are slightly different (p = 0.07; n = 3 for Sd-Tg cultures). The above experiments indicated that anti-chromatin B cells responded to CpG ODN stimulation by proliferating. This proliferation could be due to a direct effect on B cells alone or to an indirect effect or enhancement by factors secreted by other splenocytes. To test whether B cells respond directly to CpG ODN stimulation, B cells were purified from Tg− BALB/c or VH3H9 Tg Igκ−/− mice and cultured as above. Because of the higher frequency of Igλ1-bearing cells, spleens from VH3H9 Tg Igκ−/− mice were used for purification of anti-chromatin B cells. Purified B cells, including VH3H9/Vλ1 anti-chromatin B cells, proliferated extensively in culture with exogenous CpG ODN (Fig. 3⇓). Thus, VH3H9/Vλ1 anti-chromatin B cells proliferate after direct stimulation through TLR9 in a manner similar to nonautoreactive B cells. Proliferation of purified B cells to exogenous stimulatory CpG ODN. B cells were purified from Tg− BALB/c or VH3H9 Tg Igκ−/− mice, CFSE labeled, and cultured with stimulatory CpG ODN or medium. Histograms are gated on live B220+Igλ1+ cells recovered at day 3 of culture. Shown are representative histograms from a sample size of n = 3. Dotted line shows mean intensity for cells cultured in medium alone. To determine whether anti-chromatin B cells are induced to differentiate into ASCs, splenocytes from Tg− BALB/c or VH3H9 Igκ−/− mice were cultured with nonstimulatory or stimulatory CpG ODN for 7 days, and culture supernatants were tested for IgM/λ1 Ab production (Fig. 4⇓A). Supernatants from either Tg− BALB/c or VH3H9 Igκ−/− cells cultured with stimulatory CpG ODN had significant and comparable levels of IgM/λ1 Ab, but minimal Ab was detected from nonstimulatory CpG ODN cultures of either genotype (Fig. 4⇓A). Ab production from in vitro stimulation cultures. A, Splenocytes from Tg− BALB/c or VH3H9 Tg Igκ−/− mice were cultured in nonstimulatory CpG (2310 ODN) or stimulatory CpG (3MD ODN) for 7 days. Before culturing, the frequency of Igλ1+ cells placed into culture was determined by flow cytometry. On day 7, culture supernatants were harvested and tested by ELISA for IgM/Igλ1 Ab content. Samples were run neat and serially diluted at 1/3 (x-axis). Both Tg− BALB/c and VH3H9 Tg Igκ−/− cultures have significantly more Ab in stimulatory CpG ODN cultures compared with their nonstimulatory CpG ODN counterparts (p < 0.05). B, ELISA results shown in A were normalized according to the number of Igλ1 B cells plated at day 0 of culture: the OD values were divided by the number of Igλ1 B cells plated in culture. This analysis shows significantly more Ab per plated Igλ1 B cell is detected from Tg− BALB/c mice compared with VH3H9 Tg Igκ−/− mice (p < 0.05). However, there is still a significant (Figure legend continues) difference between VH3H9 Tg Igκ−/− cells cultured in stimulatory vs nonstimulatory CpG ODN (p < 0.05). C–E, Splenocytes from Tg− BALB/c and VH3H9 Tg Igκ−/− mice were plated at equal total cell numbers and cultured for 4 days in medium alone, nonstimulatory CpG ODN, or stimulatory CpG ODN. Cells were then harvested and plated (without compensating for cell concentration to account for cell death) onto ELISPOT plates to detect IgM/Igλ1+ ASC formation. ASC counts were also determined at day 0. C, ASC raw counts from days 0 and 4 plated wells are graphed. ∗∗, Significant difference (p < 0.05) between stimulatory CpG and either medium alone or nonstimulatory CpG. Comparing ASC counts between Tg− BALB/c and VH3H9 Tg Igκ−/− cultures, p = 0.07. D, Data was normalized by taking into account how many Igλ1 B cells were plated on day 0 of culture. There is no significant difference between Tg− BALB/c and VH3H9 Tg Igκ−/− cultures, p = 0.30. E, Using the ImmunoSpot 3 software, mean size of spots was calculated (limited to spots between 0.0146–0.1525 mm2 in size). ASC spots from VH3H9 Tg Igκ−/− mice were significantly smaller than from Tg− BALB/c mice (p < 0.05). For A–E, n = 4. 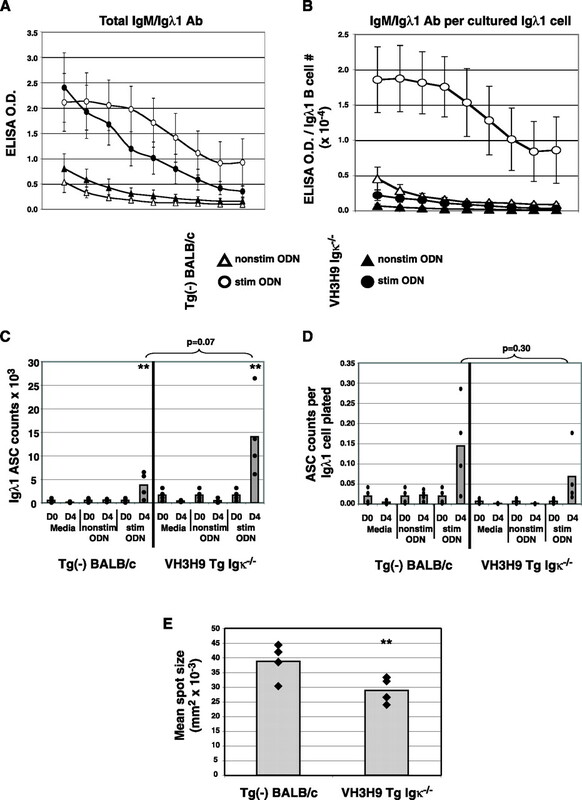 Because VH3H9 Tg Igκ−/− mice have 10 times more frequent Igλ1 B cells than Tg− BALB/c (κ-sufficient) mice (a mean of 1.1 × 104± 1 × 103 Igλ1 B cells from Tg− BALB/c spleens vs 1.2 × 105± 2 × 104 Igλ1 B cells from VH3H9 Tg Igκ−/− spleens were plated in cultures for ELISA), the amount of IgM/λ1 Ab detected in the culture supernatants was normalized according to the number of Igλ1 B cells plated on day 0 of cell culture. Notably, the amount of Igλ1 Ab produced by the VH3H9 Tg Igκ−/− B cells in response to stimulatory CpG ODN represents a significant increase over Ab observed with nonstimulatory CpG ODN cultures, whether or not the Ab levels are normalized (p < 0.05, Fig. 4⇑, A and B). However, the normalization based on input Igλ1 B cell number reveals a significant distinction between Tg− BALB/c and VH3H9 Igκ−/− cultured cells, with Tg− Igλ1 Ab production being much higher when normalized per cell (Fig. 4⇑B). This difference may be due to a lower frequency of Igλ1 B cells from VH3H9 Igκ−/− mice producing Ab, or to a lower amount of Ab per Igλ1 B cell being produced. To distinguish between these possibilities, Ab production was measured using an ELISPOT assay (Fig. 4⇑, C–E). Splenocytes from Tg− BALB/c and VH3H9 κ−/− mice were cultured for 4 days in medium alone, nonstimulatory CpG ODN, or stimulatory CpG ODN, and then measured for Ab production on a per cell basis. For both Tg− BALB/c and VH3H9 κ−/− cells, a significant number of Igλ1+ ASCs were observed in the presence of stimulatory CpG ODN, but not medium alone or nonstimulatory CpG ODN (Fig. 4⇑C). When the ASC counts were normalized according to the number of Igλ1 B cells plated, no significant difference in ASCs per Igλ1 B cell generated from VH3H9 κ−/− mice compared with Tg− BALB/c mice was noted (p = 0.30, Fig. 4⇑D). However, there was a significant difference in mean spot size between Tg− BALB/c and VH3H9 Tg Igκ−/− cells (p = 0.04, Fig. 4⇑E). Thus, it appears that a similar frequency of Igλ1 B cells produce Ab from VH3H9 Tg Igκ−/− mice compared with Tg− BALB/c mice, but that a lower amount of Ab per Igλ1 B cell is produced from VH3H9/Vλ1 B cells. To identify the VH3H9 B cells that proliferate in culture with medium alone, VH3H9 Tg B cells were labeled with CFSE and cultured for 3 days. Cells were then harvested, and those that had proliferated (B220+CFSElow) were purified by cell sorting and used to generate hybridomas (Fig. 5⇓). Nine hybridomas were recovered and are described in Table I⇓. All of the hybridomas secrete an IgM/κ Ab (Table I⇓), and carry the VH3H9 H chain. L chain sequencing revealed a restricted diversity of Igκ L chains, with the Vκ12-46 L chain being used by four of the nine hybridomas (5361-1, -4, -8, and -9; Table I⇓). All had identical V genes that matched the germline Vκ12-46 sequence (53). Hybridoma 5361-9 appears to be independent from the other three hybridomas by virtue of its different J chain; alternatively, it could be related but have undergone a secondary L chain rearrangement. Additionally, 5361-8 has an out-of-frame rearrangement of Vκ21-12 to Jκ5. The L chain for hybridoma 5361-3 is most similar to cf9 (53), with three nucleotide changes compared with the germline sequence (data not shown). Diagram depicting production of hybridomas from spontaneously proliferating B cells. Splenocytes from a VH3H9 Tg mouse were CFSE labeled and cultured in medium alone for 3 days. B220+CFSElow (proliferated) cells were isolated by cell sorting and fused without further stimulation to make hybridomas. Supernatants from the hybridomas were tested for their antigenic reactivity in a variety of assays. First, they were tested for binding to nuclei in an ANA assay (Fig. 6⇓). As previously reported, the VH3H9/λ1 Ab binds to nuclei and condensed chromatin of cells in mitosis (Ref. 49 and Fig. 6⇓). Of the hybridomas, only 5361-3 showed bright staining of condensed chromatin, but weak to negligible nuclear binding (Fig. 6⇓). Other hybridomas (5361-1, -2, -4, -8, and -9) showed various levels of cellular staining, with binding to cytoplasmic areas, but with no discernible specific nuclear patterns (data not shown). ANA staining patterns given by supernatants from hybridomas isolated from spontaneously proliferating B cells. Nine hybridomas were prepared as described and their supernatants tested for staining in the ANA assay to detect IgM Abs. 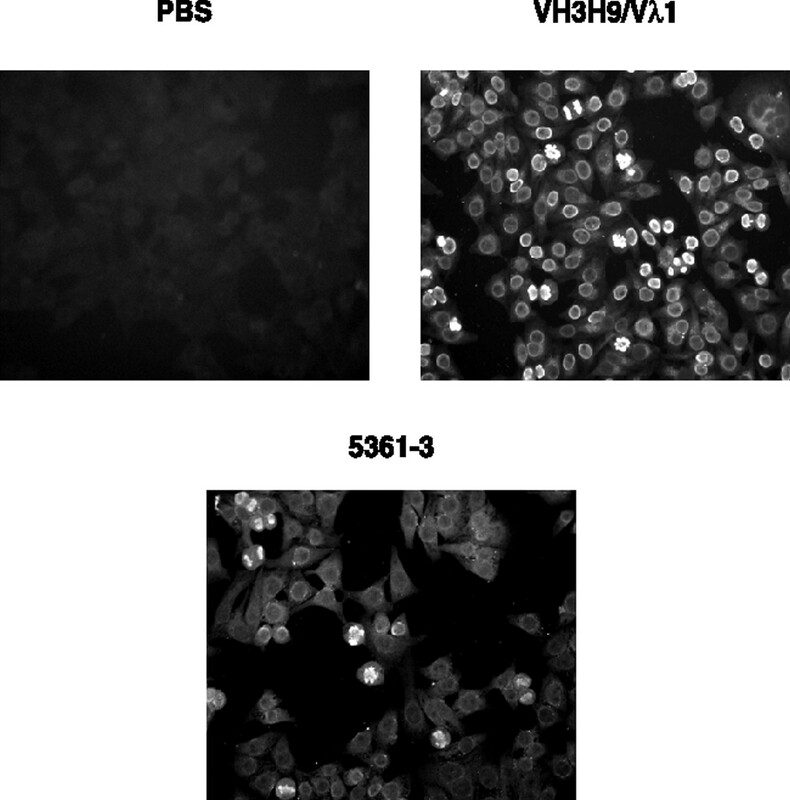 Shown are the staining patterns of the negative control (secondary Ab alone), positive control (VH3H9/Vλ1 supernatant) and 5361-3 supernatant. Photographs were taken with the same exposure time. Magnification, ×20. To further test for nuclear reactivity, hybridoma supernatants were assayed using an anti-chromatin ELISA. Consistent with its ANA pattern, hybridoma 5361-3 exhibited high binding to chromatin relative to binding to background (binding to ELISA plates not coated with chromatin) (Fig. 7⇓ and Table I⇑). Hybridomas 5361-4, -7, -8, -9, and -11 also showed positive reactions with chromatin, however the background staining levels of these hybridomas were high (Fig. 7⇓ and Table I⇑). Anti-chromatin activity of hybridomas isolated from spontaneously proliferating B cells. Supernatants were tested for binding to chromatin-coated (A) or uncoated (B) ELISA plates beginning at standardized concentration of 0.13 μg/ml and serially diluting 1/2. Shown are OD values generated from all hybridomas tested as well as from the VH3H9/λ1 Ab. Because many of the hybridomas exhibited a high degree of background staining as well as appearing “sticky” in the ANA assay, we tested the polyreactivity of these hybridomas against a variety of Ags: cardiolipin, GST, actin, insulin, LPS, and myosin (11, 54, 55, 56). Most hybridomas, with the exception of 5361-3, appeared polyreactive, exhibiting a high degree of binding to multiple Ags (Fig. 8⇓ and 9⇓). 5361-3 exhibited little to no binding to any of the Ags tested (besides chromatin). Binding of hybridomas to cardiolipin. Supernatants were tested in an anti-cardiolipin ELISA as well as binding to BSA, beginning at standardized concentration of 0.13 μg/ml and serially diluting 1/2, in duplicate. Values for binding to BSA/plate plastic were subtracted from the values for cardiolipin binding, and graphed, with SDs for each value shown. Also shown is the value for the positive control (FB1) (45 ). Binding of hybridomas to multiple Ags. Supernatants were normalized so that all supernatants contained the same amount of Ig (0.13 μg/ml). They were then diluted serially 1/2 and dilutions tested by ELISA for binding to the following reagents: A, GST; B, actin; C, insulin; D, LPS; and E, myosin. Shown are OD values for all hybridomas as well as VH3H9/λ1 Ab. Several Abs also displayed binding to cells in various stages of induced apoptosis (Fig. 10⇓) with most localizing to membrane and cytoplasmic areas that do not coincide with either the DNA stain or the annexin V staining (5361-1, -2, -4, -5, -7, and -8, Fig. 10⇓). The exception is hybridoma 5361-3, which shows clear, specific chromatin staining once the chromatin is fragmented in apoptosis (Fig. 10⇓). Other hybridomas (5361-9, and -11) also bound weakly and variably to nuclear areas in apoptotic cells, including nuclear blebs, although with less intensity and consistency than 5361-3 (Fig. 10⇓). Importantly, no Abs bound to nonapoptotic cells (data not shown). Binding of hybridomas to apoptotic cells. Jurkat cells were induced into apoptosis and then stained for the following: quadrant 1, annexin V (green); quadrant 2, Sytox Orange (blue); quadrant 3, hybridoma supernatant (red); and quadrant 4, overlay of all three stains. Line on each graph indicates size. We have examined the mitogen responsiveness of anti-chromatin B cells to determine whether safeguards are in place to prevent autoreactive B cell activation by T-independent means. Previous experiments demonstrated that VH3H9/λ1 anti-chromatin B cells are hypoproliferative in response to LPS (37). In contrast, we demonstrate here that VH3H9/λ1 anti-chromatin B cells proliferate in response to stimulatory CpG. The proliferation of anti-chromatin B cells to CpG ODN illustrates the potential for autoreactive B cells to become activated in the absence of T cell help. Importantly, however, and similar to findings reported by Rui et al. (35) using the hen-egg-lysozyme B cell tolerance model, Ag-experienced anti-chromatin B cells produce suboptimal amounts of Ab following CpG stimulation compared with Ag-inexperienced B cells. Likewise, other transgenic models also have shown suboptimal Ab production by autoreactive B cells in response to LPS (36). The responsiveness of anti-chromatin B cells to TLR9 is especially intriguing in light of the hypothesis that one unifying characteristic of the spectrum of autoantibodies arising in lupus may be the ability to bind Ags containing TLR ligands (6, 22, 25, 57). In the case of RF B cells, for example, the BCR is activated via immune complexes which can trap and transport ligands to TLR9 (6, 22, 25, 57). B cells that bind TLR-containing Ags, such as RF and anti-chromatin B cells, may be activated by the combined signaling through the BCR and the subsequent signaling through the TLR (16, 22, 25, 26, 58). In in vitro cultures, chromatin appears to be released from dead and dying cells to form multivalent DNA-containing immune complexes (22, 24, 25). The chromatin released into culture fluids from apoptotic cells may be partially enriched for hypomethylated CpG stretches of DNA, or may be a more stimulatory TLR9 ligand because of other modifications (25). Here, we confirm that a significant fraction of VH3H9 Tg B cells proliferate in medium-alone cultures. Furthermore, this spontaneous proliferation is blocked by the addition of inhibitory CpG ODN (Fig. 1⇑), suggesting a role for TLR9 signaling (25). Since submission of this article, data have been published that broaden the inhibitory effects of ODN-2088 to include TLR7 (31, 59). Therefore, we cannot rule out a role for TLR7 in our studies. As cell-sorted VH3H9 Tg B cells retain the capacity to proliferate in medium alone, this appears to be a direct activation of the B cells. 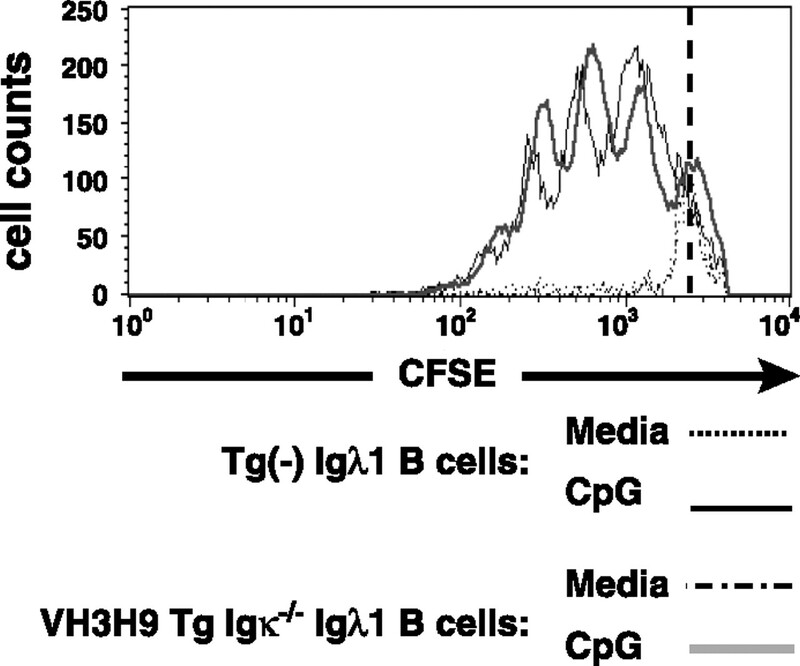 Unlike VH3H9 Tg B cells, Tg− B cells do not have this property to a discernible level (Fig. 1⇑). Thus, the VH3H9 H chain appears particularly well-suited for binding to Ags, which include DNA, chromatin, histones, and may also predispose toward polyreactivity (60). Additionally, recent data from Radic and colleagues (61) suggested that the germline form of the VH3H9 biases the repertoire toward cardiolipin binding, and that nuclear reactivity is obtained by somatic mutation and combination with permissive L chains. Consistent with the model put forth by Marshak-Rothstein and colleagues (6) that nuclear-reactive B cells may be activated by binding to endogenous Ags that also trigger TLR9, one hybridoma, 5361-3, binds chromatin as well as mitotic figures in the ANA assay. Furthermore, this Ab exhibits strong nuclear binding to fragmented chromatin in apoptotic cells. Importantly, this hybridoma exhibits little or no reactivity with any other Ags tested. Strikingly, while the well-defined VH3H9/λ1 anti-chromatin B cells proliferated well in response to exogenous stimulatory CpG ODN, they did not proliferate in response to endogenous ligands in medium-alone cultures. At present, the reason behind the inability of VH3H9/λ1 anti-chromatin B cells to proliferate, as opposed to hybridoma 5361-3, is unclear. The differences in responsiveness highlight the diversity that is found among autoreactive B cells (1, 50). Whereas RF B cells appear phenotypically unaffected by their Ag in vivo (23), VH3H9/λ1 anti-chromatin B cells undergo chronic antigenic stimulation beginning in the bone marrow that is of a sufficient magnitude to result in their developmental arrest and the down-regulation of their surface Ig (62). The phenotype of B cells that would be the counterpart of hybridoma 5361-3 is unknown, as there is currently no means to track these cells in vivo. Differences in antigenic experience and surface BCR levels may have consequences for the B cells, including their responsiveness to TLR ligation. Experiments are being initiated to test whether the VH3H9/λ1 B cells are able to sufficiently bind and/or shuttle the endogenous CpG ligands to the appropriate endosomal compartments. An inability to do so may limit the responsiveness of VH3H9/λ1 B cells to endogenous ligands, whereas stimulatory CpG ODN provided in vitro may be able to independently access the endosomal compartments and thereby induce proliferation. Interestingly, most hybridomas generated from the spontaneously proliferating B cells exhibited polyreactive binding. 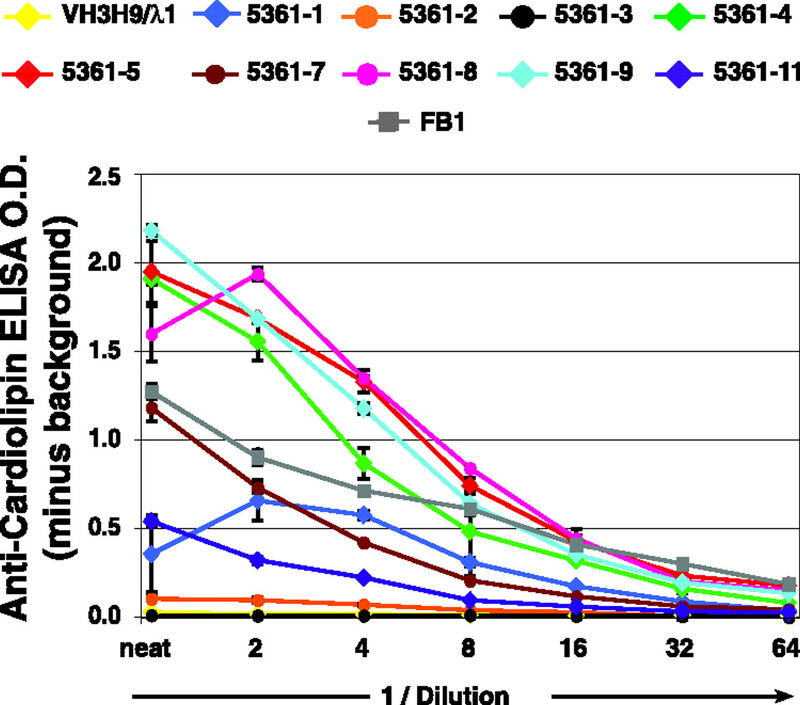 Four of the nine hybridomas (5361-1, -4, -8, and -9) used the Vκ12/46 L chain (previously called Vκ12/13a (34)), which was the most frequently recovered L chain used in spontaneous and LPS-generated hybridoma panels from VH3H9 Tg mice (34, 47, 63). Hybridomas 5361-1 and -4 are indistinguishable from one another in terms of their gene segment usage (Table I⇑). Recovering multiple hybridomas with the same L chain could indicate clonal relatedness (either due to expansion in vivo or in vitro proliferation), but this is difficult to verify, as the hybridomas do not carry somatic mutations which might more definitively mark them as being descended from the same precursor. When associated with the VH3H9 H chain, Vκ12/46 L chains are among those that have been characterized as “editor” L chains by virtue of their frequent recovery as hybridomas from VH3H9 mice; such L chains have been proposed to ablate or lessen reactivity of the VH3H9 H chain toward nuclear Ags (47). The overrepresentation of Vκ12/46 in VH3H9 Tg mice might also be due to the polyreactive nature of Vκ12/46/VH3H9 Abs. Their ability to respond to multiple ligands, including endogenous TLR9 ligands, may lead to their positive selection in vivo or their preferential recovery as hybridomas in vitro. A similar model has been put forth by Weigert and colleagues (64) to account for the frequent use of edited receptors in the VH3H9/56R Tg model. Polyreactive B cells and Abs have been detected in the sera of both healthy and autoimmune people and mice (65, 66, 67, 68). Greater than half of the early immature B cells in healthy individuals are said to be polyreactive, but most of these do not make it past the immature B cell stage (68). In contrast, systemic lupus erythematosus patients (before administration of immunosuppressive therapy) appear to have higher frequencies of polyreactive Abs in the mature B cell compartment compared with healthy controls (56). A similar defect has been described in patients with rheumatoid arthritis (69). An increase in polyreactive Abs has also been documented in (NZB × NZW)F1 mice with advancement of disease (70) and some polyreactive Abs have been shown to be nephritogenic (71). Our data suggest that polyreactive B cells may be particularly susceptible to activation through endogenous ligands that trigger through TLR9. Given that many of the hybridomas also bound to apoptotic, but not live, cells, binding to Ags from apoptotic cells in medium-alone cultures may provide both antigenic stimulation as well as being a source of TLR9 ligands. Binding of these types of B cells to self-Ags provided by apoptotic cells (28) could be a way of activating this repertoire in vivo. This appears particularly relevant, as inappropriate expression or clearing of these Ags is strongly associated with production of systemic lupus erythematosus-associated autoantibodies (72, 73, 74). We thank Antonio Pagán for technical help with the ELISPOT assays and analyses, and Drs. Ann Marshak-Rothstein and Marko Radic for review of the manuscript and helpful discussions. We additionally thank Dr. Ann Marshak-Rothstein for suggesting the cardiolipin-binding experiments. ↵1 This work was supported by National Institutes of Health Grants AI32137 and AR47913 (to J.E.) and the Commonwealth Universal Research Enhancement Program, Pennsylvania Department of Health (to J.E.). M.M. was supported by a grant from the American Heart Association. ↵3 Abbreviations used in this paper: ASC, Ab-secreting cell; ODN, oligodeoxynucleotide; RF, rheumatoid factor; Tg, transgene; SA, streptavidin; AP, alkaline phosphatase; ANA, anti-nuclear Ab. Fields, M. L., J. Erikson. 2003. The regulation of lupus-associated autoantibodies: immunoglobulin transgenic models. Curr. Opin. Immunol. 15: 709-717. Chan, O. T., L. G. Hannum, A. M. Haberman, M. P. Madaio, M. J. Shlomchik. 1999. A novel mouse with B cells but lacking serum antibody reveals an antibody-independent role for B cells in murine lupus. J. Exp. Med. 189: 1639-1648. Seo, S.-J., M. L. Fields, J. L. Buckler, A. J. Reed, L. Mandik-Nayak, S. A. Nish, R. J. Noelle, L. A. Turka, F. D. Finkelman, A. J. Caton, J. Erikson. 2002. The impact of T helper and T regulatory cells on the regulation of anti-double-stranded DNA B cells. Immunity 16: 535-546. Mamula, M. J., R.-H. Lin, J. Charles, A. Janeway, J. A. Hardin. 1992. 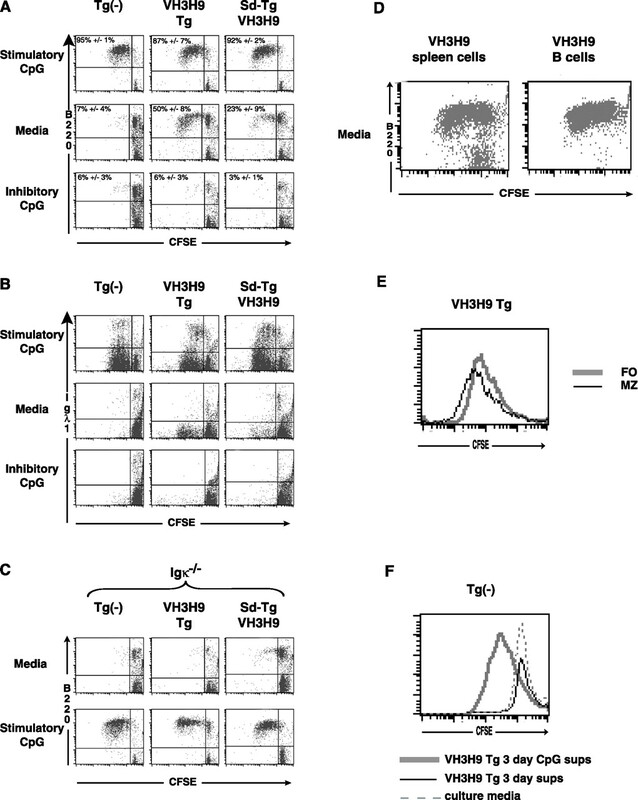 Breaking T cell tolerance with foreign and self co-immunogens: a study of autoimmune B and T cell epitopes of cytochrome c. J. Immunol. 149: 789-795. Pasare, C., R. Medzhitov. 2004. Toll-like receptors and acquired immunity. Semin. Immunol. 16: 23-26. Rifkin, I. R., E. A. Leadbetter, L. Busconi, G. Viglianti, A. Marshak-Rothstein. 2005. Toll-like receptors, endogenous ligands, and systemic autoimmune disease. Immunol. Rev. 204: 27-42. Krieg, A.. 2002. A role for Toll in autoimmunity. Nat. Immunol. 3: 423-424. Ray, S. K., C. Putterman, B. Diamond. 1996. Pathogenic autoantibodies are routinely generated during the response to foreign antigen: a paradigm for autoimmune disease. Proc. Natl. Acad. Sci. USA 93: 2019-2024. Petrovas, C., P. G. Vlachoyiannopoulos, T. Kordossis, H. M. Moutsopoulos. 1999. Anti-phospholipid antibodies in HIV infection and SLE with or without anti-phospholipid syndrome: comparisons of phospholipid specificity, avidity and reactivity with β2-GPI. J. Autoimmun. 13: 347-355. Loizou, S., S. Singh, E. Wypkema, R. A. Asherson. 2003. Anticardiolipin, anti-β2-glycoprotein I and antiprothrombin antibodies in black South African patients with infectious disease. Ann. Rheum. Dis. 62: 1106-1111. Brummel, R., P. Lenert. 2005. Activation of marginal zone B cells from lupus mice with type A(D) CpG-oligodeoxynucleotides. J. Immunol. 174: 2429-2434. Lenert, P., A. Goeken, B. S. Handwerger, R. F. Ashman. 2003. Innate immune responses in lupus-prone Palmerston North mice: differential responses to LPS and bacterial DNA/CpG oligonucleotides. J. Clin. Immunol. 23: 202-213. Lenert, P., R. Brummel, E. H. Field, R. F. Ashman. 2005. TLR-9 activation of marginal zone B cells in lupus mice regulates immunity through increased IL-10 production. J. Clin. Immunol. 25: 29-40. Anders, H. J., V. Vielhauer, V. Eis, Y. Linde, M. Kretzler, G. Perez de Lema, F. Strutz, S. Bauer, M. Rutz, H. Wagner, et al 2004. Activation of Toll-like receptor-9 induces progression of renal disease in MRL-Faslpr mice. FASEB J. 18: 534-536. Ogata, H., I.-H. Su, K. Miyake, Y. Nagai, S. Akashi, I. Mecklenbräuker, K. Rajewsky, M. Kimoto, A. Tarakhovsky. 2000. The Toll-like receptor protein RP105 regulates lipopolysaccharide signaling in B cells. J. Exp. Med. 192: 23-29. Miyake, K., H. Ogata, Y. Nagai, S. Akashi, M. Kimoto. 2000. Innate recognition of lipopolysaccharide by Toll-like receptor 4/MD-2 and RP105/MD-1. J. Endotoxin Res. 6: 389-391. Leadbetter, E. A., I. R. Rifkin, A. H. Hohlbau, B. C. Beaudette, M. J. Shlomchik, A. Marshak-Rothstein. 2002. Chromatin-IgG complexes activate B cells by dual engagement of IgM and Toll-like receptors. Nature 416: 603-607. Shlomchik, M. J., D. Zharhary, T. Saunders, S. A. Camper, M. G. Weigert. 1993. A rheumatoid factor transgenic mouse model of autoantibody regulation. Int. Immunol. 5: 1329-1341. Rifkin, I., E. Leadbetter, B. Beaudette, C. Kiani, M. Monestier, M. Shlomchik, A. Marshak-Rothstein. 2000. Immune complexes present in the sera of autoimmune mice activate rheumatoid factor B cells. J. Immunol. 165: 1626-1633. Viglianti, G. A., C. M. Lau, T. M. Hanley, B. A. Miko, M. J. Shlomchik, A. Marshak-Rothstein. 2003. Activation of autoreactive B cells by CpG dsDNA. Immunity 19: 837-847. Ahmad-Nejad, P., H. Hacker, M. Rutz, S. Bauer, R. M. Vabulas, H. Wagner. 2002. Bacterial CpG-DNA and lipopolysaccharides activate Toll-like receptors at distinct cellular compartments. Eur. J. Immunol. 32: 1958-1968. Wang, Y., A. M. Krieg. 2003. Synergy between CpG- or non-CpG DNA and specific antigen for B cell activation. Int. Immunol. 15: 223-231. Rosen, A., L. Casciola-Rosen, J. Ahearn. 1995. Novel packages of viral and self-antigens are generated during apoptosis. J. Exp. Med. 181: 1557-1561. Cocca, B., A. Cline, M. Radic. 2002. Blebs and apoptotic bodies are B cell autoantigens. J. Immunol. 169: 159-166. Christensen, S. R., M. Kashgarian, L. Alexopoulou, R. A. Flavell, S. Akira, M. J. Shlomchik. 2005. Toll-like receptor 9 controls anti-DNA autoantibody production in murine lupus. J. Exp. Med. 202: 321-331. Roark, J. H., C. L. Kuntz, K.-A. Nguyen, A. J. Caton, J. Erikson. 1995. Breakdown of B cell tolerance in a mouse model of SLE. J. Exp. Med. 181: 1157-1167. Rui, L., C. G. Vinuesa, J. Blasioli, C. C. Goodnow. 2003. Resistance to CpG DNA-induced autoimmunity through tolerogenic B cell antigen receptor ERK signaling. Nat. Immunol. 4: 594-600. Kilmon, M. A., J. A. Rutan, S. H. Clarke, B. J. Vilen. 2005. Cutting edge: low-affinity, Smith antigen-specific B cells are tolerized by dendritic cells and macrophages. J. Immunol. 175: 37-41. Mandik-Nayak, L., S.-J. Seo, A. Eaton-Bassiri, D. Allman, R. R. Hardy, J. Erikson. 2000. Functional consequences of the developmental arrest and follicular exclusion of anti-double-stranded DNA B cells. J. Immunol. 164: 1161-1168. Chen, C., Z. Nagy, E. Prak, M. Weigert. 1995. Immunoglobulin heavy chain gene replacement: a mechanism of receptor editing. Immunity 3: 747-755. Chen, J., M. Trounstine, C. Kurahara, F. Young, C.-C. Kuo, Y. Xu, J. F. Loring, F. W. Alt, D. H. Huszar. 1993. B cell development in mice that lack one or both immunoglobulin κ light chain genes. EMBO J. 12: 821-830. Fields, M. L., S. A. Nish, B. D. Hondowicz, M. H. Metzgar, G. N. Wharton, A. J. Caton, J. Erikson. 2005. The influence of effector T cells and Fas ligand on lupus-associated B cells. J. Immunol. 175: 104-111. Hardy, R. R., C. E. Carmack, S. A. Shinton, J. D. Kemp, K. Hayakawa. 1991. Resolution and characterization of pro-B and pre-B cell stages in normal mouse bone marrow. J. Exp. Med. 173: 1213-1225. Stunz, L. L., P. Lenert, D. Peckham, A. K. Yi, S. Haxhinasto, M. Chang, A. M. Krieg, R. F. Ashman. 2002. Inhibitory oligonucleotides specifically block effects of stimulatory CpG oligonucleotides in B cells. Eur. J. Immunol. 32: 1212-1222. Wells, A. D., H. Gudmundsdottir, L. A. Turka. 1997. Following the fate of individual T cells throughout activation and clonal expansion: signals from T cell receptor and CD28 differentially regulate the induction and duration of a proliferative response. J. Clin. Invest. 100: 3173-3183. Mandik-Nayak, L., S.-J. Seo, C. Sokol, K. M. Potts, A. Bui, J. Erikson. 1999. MRL-lpr/lpr mice exhibit a defect in maintaining developmental arrest and follicular exclusion of anti-double-stranded DNA B cells. J. Exp. Med. 189: 1799-1814. Nicolo, D., B. I. Goldman, M. Monestier. 2003. Passive administration of antiphospholipid antibody reduces atherosclerosis in LDLR−/− mice. Arthritis Rheum. 48: 2974-2978. Radic, M., T. Marion, M. Monestier. 2004. Nucleosomes are exposed at the cell surface in apoptosis. J. Immunol. 172: 6692-6700. Prak, E. L., M. Trounstine, D. Huszar, M. Weigert. 1994. Light chain editing in κ-deficient animals: a potential mechanism of B cell tolerance. J. Exp. Med. 180: 1805-1815. Fields, M. L., C. L. Sokol, A. Eaton-Bassiri, S.-J. Seo, M. P. Madaio, J. Erikson. 2001. Fas/Fas ligand deficiency results in altered localization of anti-double-stranded DNA B cells and dendritic cells. J. Immunol. 167: 2370-2378. Radic, M. Z., M. A. Mascelli, J. Erikson, H. Shan, M. Weigert. 1991. Ig H and L chain contributions to autoimmune specificities. J. Immunol. 146: 176-182. Fields, M. L., B. D. Hondowicz, G. N. Wharton, B. S. Adair, M. H. Metzgar, S. T. Alexander, A. J. Caton, J. Erikson. 2005. The regulation and activation of lupus-associated B cells. Immunol. Rev. 204: 165-183. Li, Y., H. Li, M. Weigert. 2002. Autoreactive B cells in the marginal zone that express dual receptors. J. Exp. Med. 195: 181-188. Schable, K. F., R. Thiebe, A. Bensch, J. Brensing-Kuppers, V. Heim, T. Kirschbaum, R. Lamm, M. Ohnrich, S. Pourrajabi, F. Roschenthaler, et al 1999. Characteristics of the immunoglobulin Vκ genes, pseudogenes, relics and orphons in the mouse genome. Eur. J. Immunol. 29: 2082-2086. Pankewycz, O. G., P. Migliorini, M. P. Madaio. 1987. Polyreactive autoantibodies are nephritogenic in murine lupus nephritis. J. Immunol. 139: 3287-3294. Yurasov, S., H. Wardemann, J. Hammersen, M. Tsuiji, E. Meffre, V. Pascual, M. C. Nussenzweig. 2005. Defective B cell tolerance checkpoints in systemic lupus erythematosus. J. Exp. Med. 201: 703-711. Herve, M., K. Xu, Y. S. Ng, H. Wardemann, E. Albesiano, B. T. Messmer, N. Chiorazzi, E. Meffre. 2005. Unmutated and mutated chronic lymphocytic leukemias derive from self-reactive B cell precursors despite expressing different antibody reactivity. J. Clin. Invest. 115: 1636-1643. Leadbetter, E. A., I. R. Rifkin, A. Marshak-Rothstein. 2003. Toll-like receptors and activation of autoreactive B cells. Curr. Dir. Autoimmun. 6: 105-122. Goeckeritz, B. E., M. Flora, K. Witherspoon, Q. Vos, A. Lees, G. J. Dennis, D. S. Pisetsky, D. M. Klinman, C. M. Snapper, J. J. Mond. 1999. Multivalent cross-linking of membrane Ig sensitizes murine B cells to a broader spectrum of CpG-containing oligodeoxynucleotide motifs, including their methylated counterparts, for stimulation of proliferation and Ig secretion. Int. Immunol. 11: 1693-1700. Vollmer, J., S. Tluk, C. Schmitz, S. Hamm, M. Jurk, A. Forsbach, S. Akira, K. M. Kelly, W. H. Reeves, S. Bauer, A. M. Krieg. 2005. Immune stimulation mediated by autoantigen binding sites within small nuclear RNAs involves Toll-like receptors 7 and 8. J. Exp. Med. 202: 1575-1585. Seal, S. N., M. Monestier, M. Z. Radic. 2000. Diverse roles for the third complementarity determining region of the heavy chain (H3) in the binding of immunoglobulin Fv fragments to DNA, nucleosomes and cardiolipin. Eur. J. Immunol. 30: 3432-3440. Radic, M. Z., J. Erikson, S. Litwin, M. Weigert. 1993. B lymphocytes may escape tolerance by revising their antigen receptors. J. Exp. Med. 177: 1165-1173. Li, Y., Y. Louzoun, M. Weigert. 2004. Editing anti-DNA B cells by Vλx. J. Exp. Med. 199: 337-346. Coutinho, A., M. D. Kazatchkine, S. Avrameas. 1995. Natural autoantibodies. Curr. Opin. Immunol. 7: 812-818. Hurez, V., G. Dietrich, S. V. Kaveri, M. D. Kazatchkine. 1993. Polyreactivity is a property of natural and disease-associated human autoantibodies. Scand. J. Immunol. 38: 190-196. Chen, Z. J., C. J. Wheeler, W. Shi, A. J. Wu, C. H. Yarboro, M. Gallagher, A. L. Notkins. 1998. Polyreactive antigen-binding B cells are the predominant cell type in the newborn B cell repertoire. Eur. J. Immunol. 28: 989-994. Samuels, J., Y. S. Ng, C. Coupillaud, D. Paget, E. Meffre. 2005. Impaired early B cell tolerance in patients with rheumatoid arthritis. J. Exp. Med. 201: 1659-1667. Hentati, B., T. Ternynck, S. Avrameas, B. Payelle-Brogard. 1991. Comparison of natural antibodies to autoantibodies arising during lupus in (NZB × NZW)F1 mice. J. Autoimmun. 4: 341-356. Madaio, M. P., J. Carlson, J. Cataldo, A. Ucci, P. Migliorini, O. Pankewycz. 1987. Murine monoclonal anti-DNA antibodies bind directly to glomerular antigens and form immune deposits. J. Immunol. 138: 2883-2889. Walport, M.. 2000. Lupus, DNase and defective disposal of cellular debris. Nat. Genet. 25: 135-136. Rosen, A., L. Casciola-Rosen. 2001. Clearing the way to mechanisms of autoimmunity. Nat. Med. 7: 664-665. Cohen, P., R. Caricchio, V. Abraham, T. Camenisch, J. Jennette, R. Roubey, H. S. Earp, G. Matsushima, E. Reap. 2002. Delayed apoptotic cell clearance and lupus-like autoimmunity in mice lacking the c-mer membrane tyrosine kinase. J. Exp. Med. 196: 135-140.